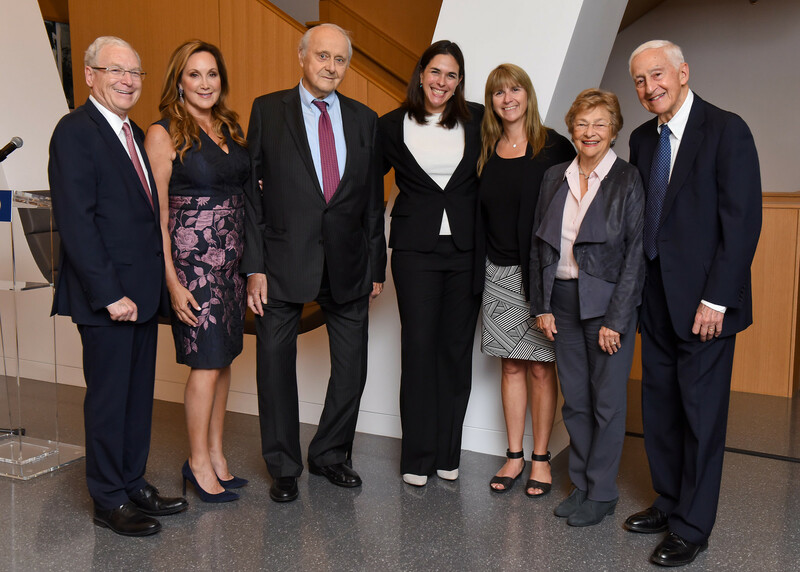 Barnard celebrated the grand opening of The Cheryl and Philip Milstein Center for Teaching and Learning on October 3. Built on the former site of Lehman Hall, The Milstein Center is a dynamic hub of academic and intellectual life on campus and reinforces the College’s commitment to sustainability and climate action. Designed by the award-winning firm Skidmore, Owings & Merrill (SOM), the 128,000-square-foot building—with a base of five floors and a tower of eleven floors adjacent to Altschul Hall—is a distinctive place that facilitates dialogue and collaboration among students and faculty. "The Milstein Center is more than a wonderful new building," said President Sian Leah Beilock at the ribbon-cutting ceremony. "It is a hub of teaching and learning, a place where we will look at pedagogy with fresh eyes and innovative tools and an opportunity to change the way we think about libraries and study spaces and how we interact in the classroom. And it will help bolster so many disciplines at Barnard that interact with technology—from the humanities to economics to our new program in computer science. It will engender opportunities for study and research that are backed by the amazing and innovative Centers." The Center is named in honor of Cheryl Glicker Milstein ’82, P’14, the newly elected chair of Barnard’s Board of Trustees, and her husband Philip Milstein ’71CC, P’14, who donated $25 million for the project. The Milsteins have long been supporters of Barnard. Cheryl was elected to the Board in 1999 and has chaired or co-chaired seven of the last eighteen Barnard galas, the College’s annual fundraiser for scholarships. The Milsteins' gift was joined by gifts from over 160 alumnae, parents, and friends of Barnard, including a gift of $25 million from the Tow Foundation on behalf of Leonard Tow and daughter Emily Tow Jackson ’88 and a $20 million gift from Diana T. Vagelos ’55 and P. Roy Vagelos, MD, '54PS. Like the Milsteins, the Tows and Vageloses have supported the College for three decades. Debora Spar, president of Barnard College from 2008-2017, shepherded The Milstein Center from its inception, with guidance from Jolyne Caruso-FitzGerald '81, chair emerita of the Board of Trustees. The $137 million building likely will be certified LEED Silver by the U.S. Green Building Council, meaning The Milstein Center has met stringent criteria under the world’s most widely used green-building rating system. The Center features approximately 12,000 square feet of green roofs and outdoor terraces that reduce the urban-heat-island effect, cut energy use and stormwater runoff, and provide inviting spaces for study, contemplation, and connection with nature on campus. The facade is made of patinated zinc shingles that harmonize with the surrounding brick, stone, and concrete buildings. Through its design and through the curricula taught there, The Milstein Center illustrates Barnard’s commitment to climate action. The Milstein Center houses the Library featuring a core collection of books, journals, zines, and special collections that support a strong liberal arts education; enhanced storage for the entire Archives collection; and a dedicated Archives Reading Room for scholarship. It also is the new home of the Barnard Center for Research on Women and the Athena Center for Leadership Studies; offices for several departments and programs; three large, light-filled seminar rooms and other learning spaces, including the Lynn Chu Classroom; the Ina R. and Howard J. Drew Conference Center; more than 370 inviting student spaces for both active and quiet study; and a grab-and-go coffee bar. At the heart of The Milstein Center are seven innovative Centers that fuse the teaching and learning of myriad disciplines from across time with twenty-first century technologies and that emphasize the importance of STEM regardless of one’s area of study. The Design Center is an incubator for creative making—supporting the design of objects and the pedagogy and learning associated with making. Upon entering the studio space, you’ll see large moveable tables that can be rearranged to support all types of projects, whether hand tools or digital tools are needed. A second room houses the laser cutter, 3D printers, and paint spray hood....I expect to model some of what happens in the Design Center with activities we have supported for years in the architecture department. For example, every semester our department invites an alumna to offer a mini-series workshop that augments our students’ design skills.…We expect to collaborate with a vast range of colleagues to support experimentation with making, and we anticipate seeing rich interdisciplinary projects coming out of the Center. The CSC will facilitate students’ understanding of how powerful tools of digital technology can help craft robust solutions to the world’s most challenging data and scientific problems. The CSC will support the undergraduate data science curriculum as well as assist students with advanced computational needs. Here, students will connect with core endeavors in data science, ranging from large-scale molecular visualization and the dynamics of galactic evolution, to mapping global population trends, the text and data-mining of early English literature, to virtually any project where computational power is required. The Movement Lab is a flexible space for movement research, exploration, and production. It is a hub for collaboration and cross-fertilization with other disciplines. It enables learning about gaming, motion capture, performance design, animation, virtual reality, transmedia dance, film, projection design, movement analysis, screen dance, and more. The Lab has a close relationship with the Media Center in equipment, staffing, and coursework. These interviews are available in full, along with additional interviews with the directors of the Centers.